Citation Information: J Clin Invest. 2005;115(2):339-347. https://doi.org/10.1172/JCI23183. We used a spheroid model of colon carcinoma to analyze integrin dynamics as a function of the epithelial-mesenchymal transition (EMT), a process that provides a paradigm for understanding how carcinoma cells acquire a more aggressive phenotype. This EMT involves transcriptional activation of the β6 integrin subunit and a consequent induction of αvβ6 expression. This integrin enhances the tumorigenic properties of colon carcinoma, including activation of autocrine TGF-β and migration on interstitial fibronectin. Importantly, this study validates the clinical relevance of the EMT. Kaplan-Meier analysis of β6 expression in 488 colorectal carcinomas revealed a striking reduction in median survival time of patients with high β6 expression. Elevated receptor expression did not simply reflect increasing tumor stage, since log-rank analysis showed a more significant impact on the survival of patients with early-stage, as opposed to late-stage, disease. Cox regression analysis confirmed that this integrin is an independent variable for these tumors. These findings define the αvβ6 integrin as an important risk factor for early-stage disease and a novel therapeutic candidate for colorectal cancer. Integrin αvβ6 expression increases following EMT. (A) LIM 1863 organoids or cells harvested 24 hours after induction of EMT were surface biotinylated, and the extracts were immunoprecipitated with an mAb directed against integrin αv or control IgG. Relative molecular masses are shown to the left in kDa. Arrows indicate the positions of αv, and its associated chains β5 and β6. (B) Cell extracts were prepared from organoids or from cells 24 hours after EMT, immunoprecipitated as in A, and then immunoblotted with an mAb against the β6 integrin subunit. Relative molecular masses are shown to the left in kDa. 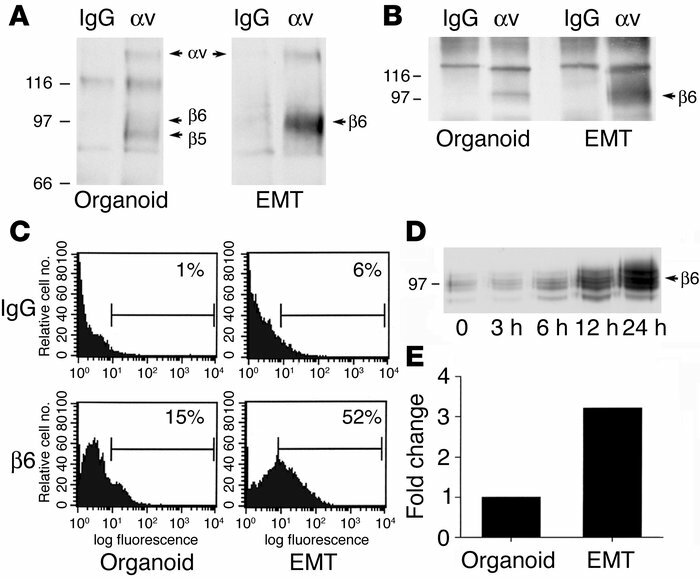 (C) LIM 1863 organoids were either disaggregated into single-cell suspensions (Organoid) or harvested 24 hours after induction of the EMT (EMT), and surface expression of β6 was assessed by flow cytometry. A greater–than–3-fold increase in β6 surface expression occurs after the EMT. (D) Cell extracts were prepared over the time course shown after EMT induction and immunoblotted with an anti-β6 antibody to determine the kinetics of upregulation of the receptor. Relative molecular masses are shown to the left in kDa. (E) Integrin β6 mRNA levels were quantified using real-time quantitative PCR in organoid or EMT cultures of LIM 1863 cells. The fold change between treatments (3.2-fold induction following the EMT) is represented graphically.